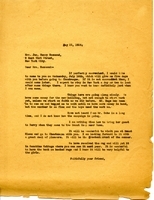 Martha Berry writes to Hammond to make housing arrangements for the upcoming visit. Seventeen rooms have been set aside and the guests will be entertained at the Girls School. 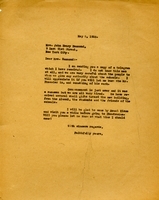 Emily Hammond advises Martha Berry not to accept any offers from Mr. Tressier and asks Miss Berry to come to Mount Kisco for a week before going to Chicago. 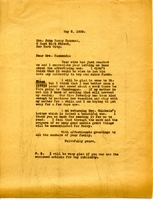 Hammond encloses a letter from Adolph Ochs and asks Martha Berry to suggest revisions. Hammond has received Louise Inman's solicitation for the Mothers Building and comments that she is glad the idea originated with a southern woman. She wants to give $1,000 and asks Berry whether to direct it to the new dormitory or through Mr. Ochs. 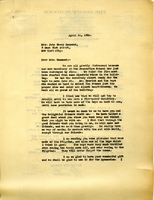 Hammond advises Berry not to be unhappy about Ochs being chosen as chair of the endowment effort, because he is the obvious choice; if any Protestant southerners object because he is a Jew, Berry should dwell on the fact that his generosity is all the more wonderful because he knows the schools are Christian. 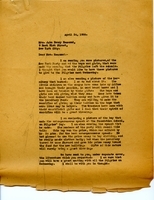 On letterhead of the Jekyl Island Club. 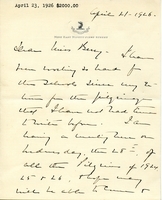 Emily Hammond encloses a letter from Louise Inman and offers to speak to the Atlanta Circle if they can come to Berry. She encloses a list of those who will travel to Berry with her in April. She has been named executrix of the estate of Clara Van Vredenburgh and believes some money will come to Berry. Martha Berry responds to Mrs. Hammond's letter and approves the dates for her stay at the school. Martha Berry is glad for Mrs. Hammond to visit. 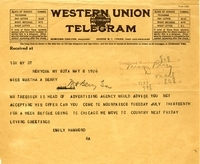 Martha Berry asks if she may come to visit on July 14th. She also tells Mrs. Hammond that there is not enough money to start the new building, but she would like to start soon while the weather is good. 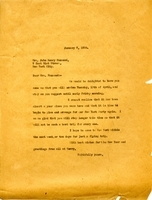 Martha Berry also thanks Mrs. Hammond for sending a rug for Sunshine Cottage. 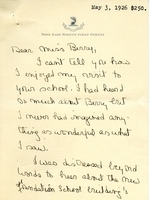 Hammond writes to Berry to tell her how enjoyable Hammond's recent trip to the schools was. 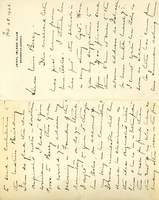 Hammond was also sorry to hear about the dormitory fire and she included a donation with her letter. Berry thanks Hammond for telling her about the advertising man who wanted to raise money for the schools. If her mother is well, Berry will definitely come to visit Mount Kisco. Martha Berry thanks Mrs. Hammond for the hospitality while she was visiting in New York. 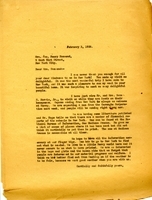 Martha Berry also informs Mrs. Hammond that Berry School financial information is available at the National Bureau of Information in New York City. Martha Berry is excited for Mrs. Hammond and the Pilgrims to visit the school in April. 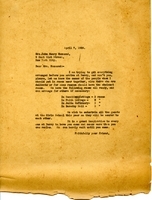 She informs Mrs. Hammond that inviting the Atlanta Circle would not be a good idea, explaining that they have found that having special days for specific groups is more successful. Martha Berry is sending Mrs. Hammond a number of pictures taken during the recent "Pilgrimage" and of the dormitory that just burnt down. 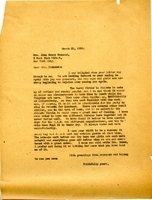 Martha Berry writes that many of the children who attend the schools have donated their own money to help rebuild the dormitory. Emily Hammond enjoyed her recent pilgrimage to the Berry Schools. She is sending two-thousand dollars--one thousand should go to the gymnasium and the other thousand should be put toward general school expenses.